A place to discuss my quilting experiences and other stuff too. Retirement certainly does a lot for productivity. I have quilted 12 quilts in the last 30 days. Five of those quilts were long standing UFOs, which are now finished. 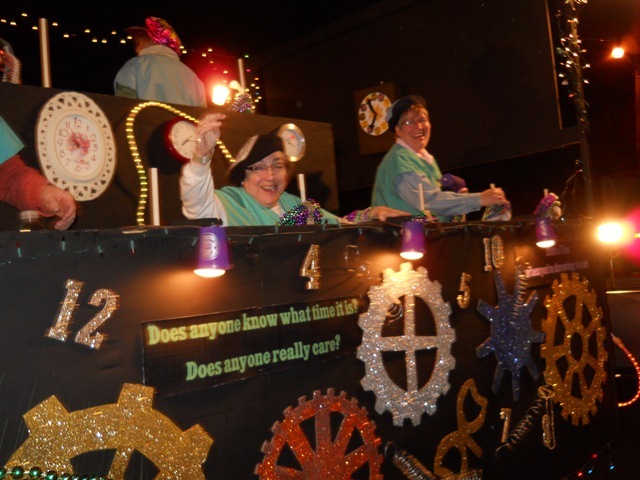 A good friend invited me to ride on her float in the Southdowns Mardi Gras Parade. It something I have never done before and I had a blast. We saw a quilter friend in the crowd and she took this picture. Had a very nice time this past weekend at our annual Super Bowl Retreat. 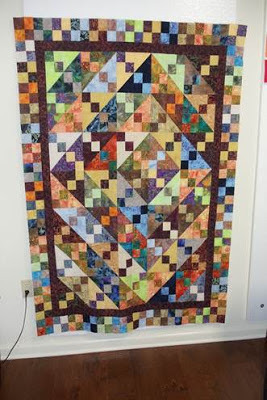 Got lots done: cut batting for 4 quilts, trimmed backs for 3 quilts, cut binding for 4 quilts, and sewed those old batik swap fabrics into this quilt top. Spent my last day ironing scraps in preparation for cutting. Had great food, lots of laughs, very little food, and the usual fabulous time!